12 oz disposable white paper cups. Hot drink cups for coffee, tea, hot cocoa etc. Pack of 120 cups, ideal pack size for family, office and party uses. Made of premium food grade paper, holds hot beverage up to 194F (90C). Unwaxed. Strong cup body with rolled rim for better lid sealing and additional strength. 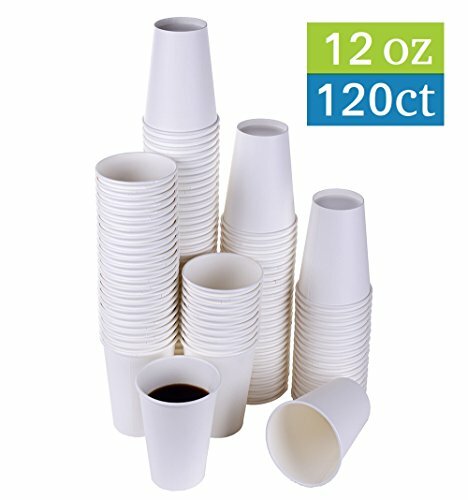 12 oz disposable hot paper coffee cups. White color. Hot drink cups for coffee, tea, hot cocoa etc. Value pack of 120 cups for family, office, restaurant and party uses. Strong cup body with rolled rim for better lid sealing. If you have any questions about this product by TashiBox, contact us by completing and submitting the form below. If you are looking for a specif part number, please include it with your message.